Land and housing are two of the most important cornerstones of any modern society—and a basic human need. In the United States, land and housing have long served as an economic engine and one of the primary sources of wealth and stability for a great number of people. However, a historical legacy of displacement and exclusion, firmly rooted in racism and discriminatory public policy, has fundamentally restricted access and shaped ownership dynamics, particularly for people of color and low-income communities. Today, many communities across the country are facing new threats of instability, unaffordability, disempowerment, and displacement due to various economic, demographic, and cultural changes that are putting increased pressure on land and housing resources. This is not limited to well-known cases such as San Francisco—where the median price of a single-family home is around $1.3 million and average monthly rent for a one-bedroom apartment can be in excess of $3,000 a month—but is an increasing problem across the country and in different types of markets. Displacement from land and exclusion from housing ownership and access has been and continues to be a multi-generational, lived experience in many American communities. This is no accident. Even a cursory look at public policy decisions in the United States over the past 200 years reveals that deeply entrenched racism have profoundly shaped and continue to shape our current system of land 4 and home ownership, access, and valuation. This ongoing injustice contributes to, among other things, the racial wealth gap, which further drives socioeconomic inequality along race lines. It has also enabled elite and corporate interests to obtain ownership of vital assets in the very communities that have suffered from a history of disinvestment, neglect, and public abandonment— often in the name of renewal and revitalization. The result: perpetuation of the wealth and ownership disparities that are seen across race and class. (CBAs)—legally enforceable contracts between developers and local community groups that often include various land and housing related benefits and requirements; and 5 Land Banks—publicly owned or nonprofit entities that allow local governments to acquire abandoned or tax delinquent properties and prepare them for productive uses. Together and through local variations and interesting new combinations, these strategies and tools can 1) begin to institutionalize democratic control of land and housing, 2) support racially and economically inclusive ownership and access, and 3) catalyze the deployment of public resources to support new norms of land and housing activity. Importantly, “anchor institutions”—large not-for-profit entities, such as hospitals and universities, that are rooted in local communities—can play a key role alongside community organizations and local governments in catalyzing and supporting such strategies. This report is based on dozens of interviews with practitioners, academics, and community members, as well as a review of various reports, studies, and surveys. It shares the resulting findings through key research insights, a review of best practices, and relevant examples. 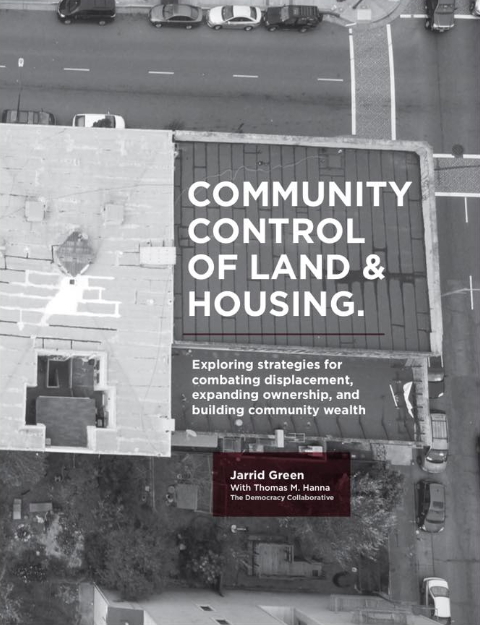 It seeks to broaden awareness, discourse, and adoption of community control of land and housing strategies among various stakeholders who have a genuine desire to see stable, healthy, equitable, and sustainable local communities flourish. These stakeholders include community activists, municipal officials, economic development professionals, community development practitioners, anchor institution leaders, and social investors.